“Don’t you shiver, shiver, shiver.” (Coldplay) Job growth slowed in March due in part to harsh weather across much of the country, but there’s more to this story. Just 103,000 jobs were created in March, much lower than the 175,000 expected, the Bureau of Labor Statistics reported. 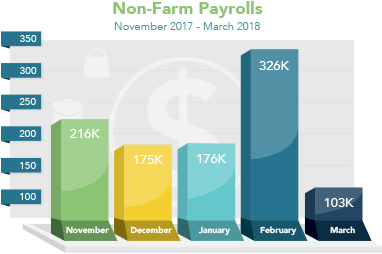 February’s report was revised higher to 326,000 new jobs from 313,000, while January was revised lower to 176,000 from 239,000. The unemployment rate was unchanged at 4.1 percent. Inflation news highlights an otherwise quiet economic calendar. Wholesale inflation data via the Producer Price Index will be released on Tuesday. The more closely-watched Consumer Price Index follows on Wednesday. On Thursday, weekly Initial Jobless Claims will be delivered. On Friday, look for the Consumer Sentiment Index. If you or someone you know has any questions about home loan products, please give me a call. I’d be happy to help.